Scleroderma Canada is pleased to share with you the great news that our Vice President of Advocacy and Public Relations, Maureen Worron-Sauvé, will be honoured by her home city of Hamilton, Ontario for her work on behalf of the scleroderma community. Read more about this honour below as you join us in congratulating Maureen on this well-deserved recognition. Longtime scleroderma activist Maureen Worron-Sauvé will be inducted into the Hamilton Gallery of Distinction on November 14, 2017 along with a diverse collection of six other community leaders. Worron-Sauvé has been active in the scleroderma community since her own diagnosis in 2002. She served as president of the Scleroderma Society of Ontario from 2008 to 2015, and as president of Scleroderma Canada from 2010 to 2015. She is currently past-president of both organizations. In 2014, the Canadian Organization for Rare Diseases presented Worron-Sauvé with the Rare Honour Award for her work in the rare-disease community and in 2016 she received the Messenger of Hope Award from the U.S.-based Scleroderma Foundation. Worron-Sauvé and her husband, former Hamilton Tiger-Cat David Sauvé, are also leaders in the progressive redevelopment of downtown Hamilton. They own a number of Tim Hortons franchises and are partners in Core Urban Inc., the award-winning developer of buildings such as The Empire Times, The Witton Lofts and The Textile Building. Scleroderma Canada promotes public awareness of scleroderma, funds research to find treatments and cures for the disease, and supports Canadians affected by scleroderma. The organization is an advocate for people affected by scleroderma and works collaboratively with regional scleroderma organizations and the international scleroderma community to achieve common objectives. Follow Scleroderma Canada on Twitter @SclerodermaCAN. An experimental stem-cell treatment has meant a “180-degree” turn in the health of an Ontario scleroderma patient. Dan Muscat, 49, developed systemic scleroderma in 2014, in which the skin all over his body began to harden and tighten due to the overproduction of collagen. It made his work as a jeweler in St. Thomas, Ont. difficult and painful. “My hands just got into a curled position and they were just locked,” he said. “It got into my face and my neck and I wasn’t able to turn my neck or even my torso. Walking became almost impossible to walk more than 20 steps.” He also lost the ability to drive, his knees unable to bend to depress the gas pedal or brakes. There were no treatments that worked to stop the disease. His doctor gave him just months to live. The disease, an autoimmune disorder of unknown cause, eventually attacks the lungs and other internal organs. Muscat began to research stem-cell therapy being tested in Canada, Europe and the United States. 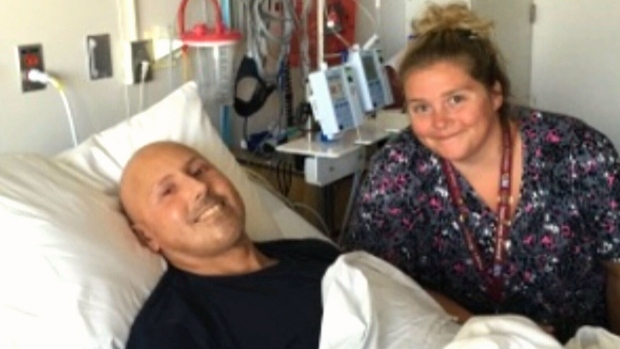 Through the Canadian Stem Cell Foundation, Muscat found Dr. Harry Atkins, a stem-cell therapy specialist at the Ottawa Hospital who was willing to try the therapy on him. Stem cell transplantation for scleroderma is quite novel in Canada. Other centres have done a lot of research on this, particularly in Europe, with encouraging results. Dr. Atkins has helped develop stem cell transplantation for other autoimmune diseases, such as multiple sclerosis, stiff person syndrome and myasthenia gravis, a condition characterized by muscle weakness. Muscat is the first patient in Canada to be treated using newer protocol tested in the U.S. and Europe. The treatment began last June, when doctors harvested stem cells from Muscat’s body. Then powerful chemotherapy drugs were used to kill off his malfunctioning immune system that was causing the scleroderma. His purified stem cells were reintroduced to his body, with the goal of resetting his immune system and halting progression of the disease. “From that day forward I have just felt I have improved on a day-to-day basis,” said Muscat. “My improvement has been just a 180-degree change,” said the father of a young boy. James Price, president and CEO of the Canadian Stem Cell Foundation, says stem cells can offer hope to those with a range of conditions who currently have no other therapies available. Price says his organization has a goal of making new stem cell based therapies available within 10 years. According to the CSCF, there is evidence that stem cell transplants can induce sustained remissions in patients with other severe autoimmune diseases such as multiple sclerosis, lupus, rheumatoid arthritis and juvenile arthritis. Stem cells are also being explored as treatments for amyotrophic lateral sclerosis (ALS or Lou Gehrig’s disease), septic shock, osteoarthritis, diabetes, macular degeneration and to prevent scarring after heart attacks. With Muscat’s apparent remission, other stem cell centres in Canada may look at offering the therapy to scleroderma patients who meet medical criteria for the procedures, opening the door to others suffering with this disease.